M.F.K. Fisher's writings loom large in the American literary landscape, and deservedly so. Wartime brings special challenges to anybody trying to eat “with both grace and gusto.” Fisher refuses to allow all pleasures to disappear from the wartime table and provides advice and recipes that creatively make the best of what can be obtained and prepared at a time of tight budget and scarcity. Food provides the springboard for reflections on topics ranging from the balanced diet to the choice of a drinking partner. Each chapter of How to Cook a Wolf presents Fisher’s thoughts on a topic: “How to Boil Water,” “How Not to Boil an Egg,” etc. The recipes (inserted in the text) are interesting, though the main pleasure of reading the book is to listen to Fisher philosophize, muse, get passionate, gently satirize (herself first), and tell stories, where she describes people and events of her life. Nine years after the publication of How to Cook a Wolf, Ms. Fisher went back to the book and annotated it. 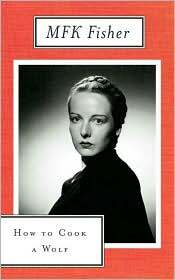 Her notes, printed enclosed in square brackets in the North Point Press edition, sound like theatrical asides where the author reflects on her earlier ideas and assertions. Sometimes she stands by her words, sometimes she amends her original words, since she thinks she has learned a thing or two in the intervening time, and sometimes she declares that she has changed her mind. I hope you'll enjoy Fisher's writing, wit, world view, and approach to cooking in challenging times. When you publish your post (or posts), you can link it up by using the inlinkz tool below, or leave a comment to this post or email me at simosite AT mac DOT com. Feel free to use a comment or email message, should you have any questions. 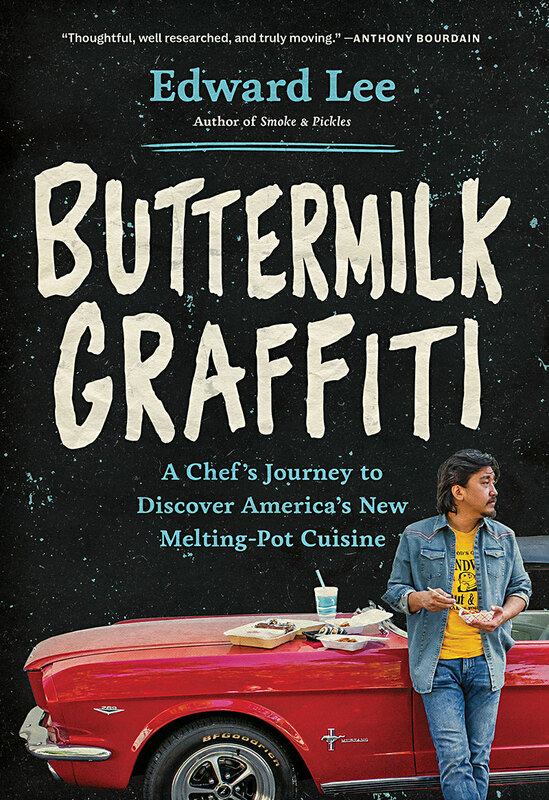 Announcing: Our Next Four Cook the Books Selections! As we dig into our current pick of How to Cook a Wolf by M.F.K. Fisher, hosted by Simona of briciole, it is time to announce the next round of Cook the Books selections, taking us all the way through March of 2014. A wonderful variety we have--two fiction, two non-fiction. We'll travel from Germany to Texas, into our own gardens and backyards, throughout America and all the way to Africa looking for delectable foodie inspiration! 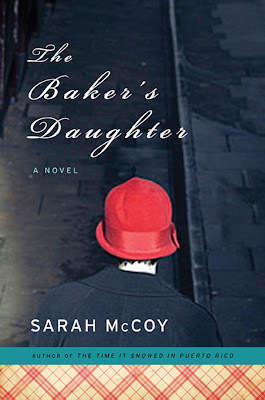 We will close out the summer traveling from Germany to Texas as Heather of girlichef shares her favorite read of 2012, The Baker's Daughter: A Novel by Sarah McCoy. Heather says, "A story that flawlessly weaves the past with the present. Two bakeries. Two countries. Two eras. We start off the year 1945 with Elsie Schmitt, a teenager who works in her father's bakery in Nazi Germany. Her life changes forever when an escaped Jewish boy appears on her doorstep on Christmas Eve. Sixty years later in El Paso, Texas, journalist Reba Adams plans on interviewing an older baker from town for a feel-good Christmas story in the local magazine. Little does she know the impact that speaking with the owner of Elsie's Germany Bakery will have on her outlook of life. Family, forgiveness, strength, and a testament to power of sharing a good loaf of bread. I hope that you'll take as much inspiration from this novel as I did - I know I can't wait to read it again!" 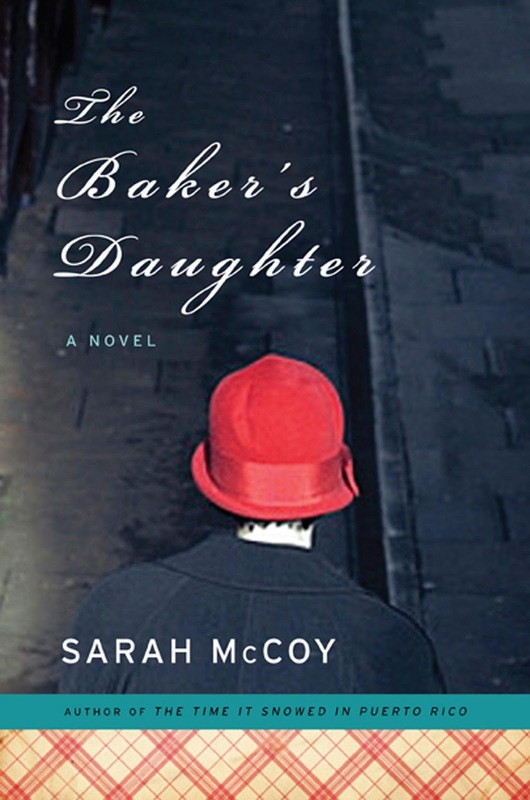 The deadline for The Baker's Daughter is Monday, September 30th. You are what you eat! Rachel, The Crispy Cook, gets us thinking local with her pick of Animal, Vegetable, Miracle: A Year of Food Life, by Barbara Kingsolver, Camille Kingsolver and Steven L. Hopp. 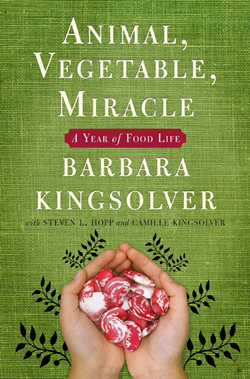 Rachel says, "Barbara Kingsolver is one of America's great modern fiction writers, but in this book, co-authored with her professor husband and recipe-sharing daughter, she provides us with an entertaining, insightful and inspiring memoir of a year spent living la vida loca-vore. The Kingsolver/Hopp family worked hard and conscientiously to eat only what they could grow, raise, gather or buy locally and their adventures in cheesemaking, pumpkin growing and turkey harvesting are all so interesting. Given that our Cook the Book clan is spread out across the globe, I am particularly interested to see what others will be inspired to share from their local bounty." The deadline for Animal, Vegetable, Miracle is Monday, November 25th. 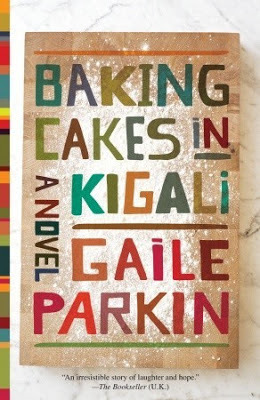 From thinking local to going global, I (Deb at Kahakai Kitchen) am taking us on a long journey to the recovering African country of Rwanda in Baking Cakes in Kigali: A Novel by Gaile Parkin. While poking around a used book store, I picked up a copy of Baking Cakes in Kigali because of its title and cover (always looking for that next CTB foodie book pick! ), and found myself getting caught up in the story. Angel Tungararza is a talented cake maker from Tanzania who moves with her husband, who has taken a job at a university, and grandchildren to modern-day Rwanda. Along with baking and selling her cakes, Angel dispenses advice to her customers who come from from all walks of life, listening over cups of tea as they share their stories. At times sad, sometimes humorous, but ultimately a life-affirming and inspiring read with an engaging heroine to love. The deadline for Baking Cakes in Kigali is Monday, January 27th. 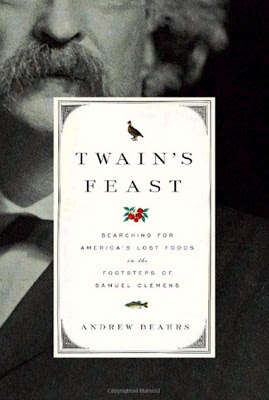 Simona of briciole takes us on a foodie journey through America via Twain's Feast: Searching for America's Lost Foods in the Footsteps of Samuel Clemens by Andrew Beahrs. Simona says, "What foods do Americans miss when they are abroad? Mark Twain's autobiographical book, A Tramp Abroad , written in 1879 while on an extended stay in Europe, includes a scathing assessment of the cuisine offered by European hotels. After negative reviews of pretty much everything he has eaten during his stay, Twain sees the light at the end of the tunnel, since he is getting ready to travel back home, where he is planning to eat: Radishes. Baked apples, with cream. Fried oysters; stewed oysters. Frogs. American coffee, with real cream. He goes on to mention about 80 more American foods from buckwheat cakes to squash pie. On first reading, the list made me think about the menu of a Baroque banquet. In Twain's Feast, Andrew Beahrs "tracked down a number of these American classics, discovering what Twain's experience of them was, what's become of them today, and what's being done to bring them back." The deadline for Twain's Feast is Monday, March 31st. There you have it—our reading list for the next several months. Start looking in your favorite bookstore, library or on-line for these four books. Happy reading, eating and cooking to you all! 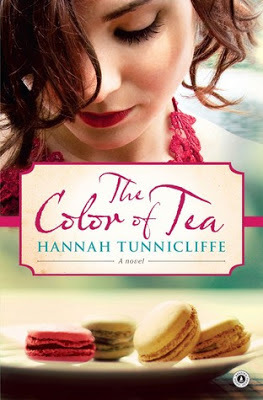 Announcing Our Winner for "The Color of Tea!" If you didn't get a chance to look through the roundup of all the dishes inspired by our April/May pick, "The Color of Tea," yet, I encourage you to do so. With the variety of beautiful baked goods and sweet and savory treats, we almost have the perfect cafe menu of our own! We certainly made the judging process difficult for author Hannah Tunnicliffe, never less, she persevered and we have the results below. Right, so, here we go.... I was enchanted by Rachel's tea eggs, even if she wasn't in love with the end result, they looked beautiful and reminded me of the century egg congee I used to eat in Macau (and how pretty they would be for Easter!). Simona's roasted carrot scones looked gorgeous (especially pictured with her homegrown delicate pink rose) as well as tasty; scones are a personal favourite for me too. I was very touched that Ana made pavlova, as it is practically New Zealand's signature dessert and I had never drawn the connection between macarons and pavlova before - very clever! Of course, I loved your raspberry-almond oat bars - the sweetness of raspberry paired with teeth-satisfying firmness, just the sort of treat I'd eat in my "office" too ;-) Then, the tarts from Marla, Louise and Heather - ooooh, I do love a tart... Louise's was the closest to the tart Grace made for Pete in the book but Marla's was so divinely simple and Heather had me at 'smoked sea salt'. Heather had made a delicious tomato tart previously, so I was very impressed she edited using seasonal produce (asparagus) and made yet another delightful tart dish. Danielle had me desperately craving a perfect New York bagel and very happily drawn into her life and loves through her great blog. Debra's macaroons were so versatile - I'm a huge coconut fan and had never thought of making them that way with a space for a filling - delicious genius! And now for my two favourites - pomegranate-vanilla macarons with chocolate ganache by Claudia and vanilla-chamomile cremeux by Camilla. Firstly, hats off to Claudia for making macarons! Dark chocolate ganache is my favourite macaron filling, cuts perfectly through their sweetness and pomegranate is a great, unique flavour idea, I'm jealous I didn't think of it myself! I can just imagine the gorgeous pink and brown delights in the glass cabinet at Lillian's. A creation Grace and Gigi would be proud of. And finally, the vanilla-chamomile cremeux. 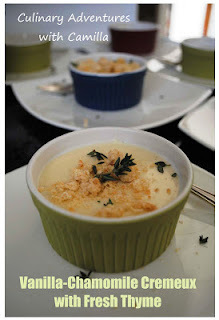 I loved the simplicity of this recipe with the addition of chamomile and topped with some thyme. It was the recipe I most wanted to make and could imagine Grace cooking it with Faith at her side, wearing a tiny apron and dipping her fingers into the cremeux. To me, the macaron and cremeux recipes would be Grace's favourites and somehow represented her life and her future. For that reason these are my two winners and I'd love to send Claudia and Camilla a little New Zealand food-themed prize if they would like to send me their addresses. As an aside, I appreciated all the feedback your readers had about The Colour of Tea. I know it is not everyone's style of novel but your readers were gracious in their criticism and genuine and thoughtful with their compliments. I laughed when I read that your readers were frustrated with Grace...I was too! Lol! But that's her - flawed and somewhat obsessive but ultimately looking for love and purpose just like the rest of us. I hope your readers grew to like her like a friend as I did. Regarding the model on the cover, I'm afraid I don't have much of a say in cover design but yes, the model is not a red-head and that amused / confused me too, although I think the overall design is lovely. If there are any other questions or feedback please let you readers know that I love being contacted and have contact forms on websites www.forkandfiction.com and www.hannahtunnicliffe.com. A big THANK YOU to Hannah, who not only wrote a terrific book but is also a truly thoughtful judge and a wonderful person! We will have the announcement post with our next four books posted later this week! Until then, we hope you are enjoying into our current selection, "How to Cook a Wolf by M.F.K. Fisher, hosted by Simona.